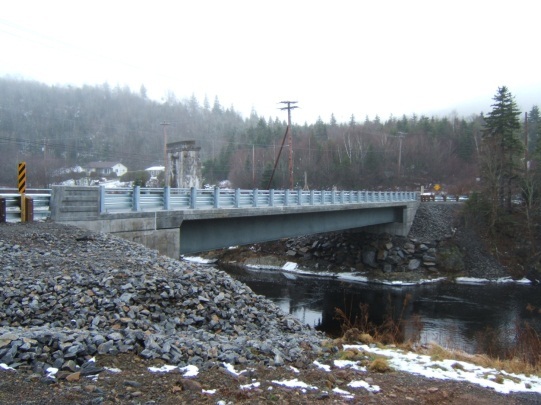 The Spanks Bridge is a 40 meter simple span steel plate girder bridge located in rural Nova Scotia and replaces a single lane aging through truss bridge at the same location that was damaged by a snow plow. Due to perched bedrock conditions on one side of the structure, semi-integral piled abutments were designed to support the three composite steel plate girder superstructure. A 90 degree sharp turn exists to the immediate east of the bridge, requiring the north wingwall to be designed with a pronounced crank to ensure that the required truck turning radius was maintained along the inside lane of the turn.